We missed the exhibition game against Russia last week while we were in NS, so our tournament started with the official games. We watched Russia barely squeak past Denmark in what turned out to be a very exciting game. Apart from pockets of Russian fans the entirety of the ACC was cheering for the underdog Danes, and with a 2-0 lead they nearly pulled it off. Alas, by the time it got to a shootout the Russian skill took over. We had almost two hours to kill before our second game, so we wandered over to Maple Leaf Square. The Real Sports Bar was predictably packed, so we went in search of Corks, a rumoured craft beer bar in the back corner of a Longo’s supermarket…no, seriously. We found it, and chose from a very solid list of local craft beer and wine. I had a Black Oak Nut Brown; Nellie had a Collective Arts Rhyme & Reason pale. Nellie was full from her earlier bucket of Coors Light at the game but I had an additional half pint — alas, the Great Lakes Winter Ale special tap was off, tasting flat & watery. Still, at $6 for a pint of craft and with local wines from Tawse, Fielding, Malivoire, etc. on tap I can see this being a regular hangout during the tournament. 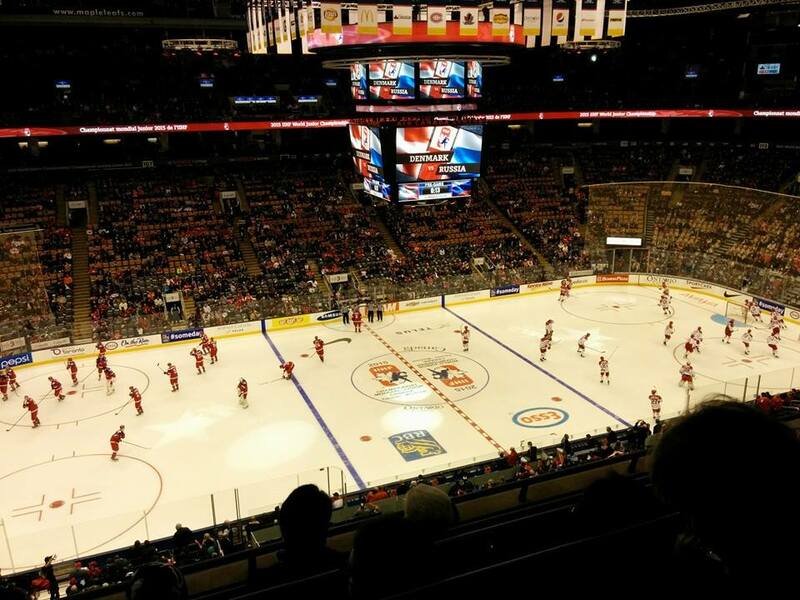 We got back to the ACC in time for game 2, wherein Sweden thumped the Czechs. The Toronto fans were delighted when their prospect, William Nylander, scored a goal. Shortly thereafter a “Go Leafs Go!” chant went up, which was as sad and painful as it sounds. With the game safely in hand we left ahead of the crowd and found some dinner. We found it in the latest outpost of Pizzeria Libretto, which we’d never visited on Ossington or the Danforth. The lineups at the original when it opened put us off for a long time, but the hype is real: the plain old pepperoni special was a perfect pizza. I can see this place becoming a new favourite. We left for home, full but not too full, and watched Canada destroy Slovakia 8-0. Today we’ll head back to the ACC to see whether Denmark can make a game of it with Sweden, and to see Switzerland make their debut.